Christmas is just one of those holidays i can't decide if i truly enjoy. I love to see family, make good food, and watch those very exciting creations that the kids bring home from school, but as soon as the Christmas season is here, i can't help but think how many people do not get to have Christmas. I am one of those that think there are too many gifts, too many parties, too much laughter. I am one of those that think there is too much sorrow for some, too much hype, too little giving, and too little recognition of what Christmas is all about. I tried hard this year to really concentrate on the true meaning of Christmas. A family tradition of my families, that I have extended to Brandon and I and our kids is the gift of giving. Every year we try to help others have a better Christmas season, it isn't much, but we try. One year we gave clothing to some kids in much need, with a holiday meal. another year we did the twelve days of Christmas to a family in need. Last year we bought warm articles of clothing and tried to give them to our "homeless" man. many of you know who he is. He refused my gifts, which made me sad, but i felt good for trying. So then I bought him a meal at MC Donald's without him knowing and had the worker deliver it to him as i left. He smiled, and sat and ate it. best gift i have witnessed in a long time. a smile from someone in need. Most of the time we give things discreetly, but this was a bitter sweet moment for me, to see the gratitude from a receiver. Last year the kids and I also took names off of the moses lake clinic tree and bought gifts for some kids. My kids had so much fun going to the store and choosing things and then dropping them off, just as Santa would do. They had a blast. This year we also helped a family in need. These are the things I thrive on during this season, but i just can't help but think it's not enough. I love the look of snow, from the inside of my house, I love hot chocolate, I love dressing up for parties, I love Christmas food, I love lights, trees and, mangers. I just tend to have a dampened spirit about the need in this world that so many forget, or feel they can't make a difference. I guess I love the true meaning of Christmas, but am saddened by the way we celebrate it. It's just a catch 22 with me. Anyway, We decided to spend Christmas with family in Utah this year. Wow, what a drive. It was a blizzard! We left at 6:30 Sunday morning, and did not arrive until 1:00 a.m. the next morning! It was horrible. We had to go about 45 mph basically the whole way. I think we got above 55 for about half hour at one point, but that's all. We kept having to pull over and try to unfreeze the wiper fluid, cause the pump would freeze and we couldn't get fluid out to wipe our windshield. There were sooooo many people off the side of the road, and several rollovers. To say the least, it was traumatic, especially for the kids. But we all did arrive safe and sound, just not very pleasant until we slept a few hours. 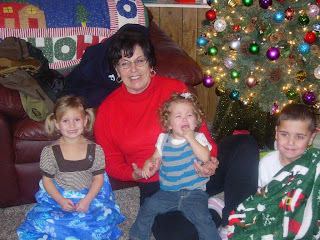 Here are the kids with Grandma Beyeler, Grandma LU for short. 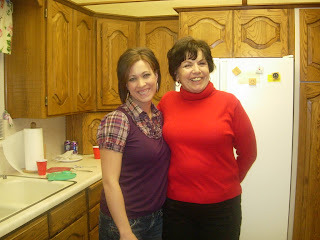 Me and My Grandma, I just love her, she is so full of life. She just goes and goes. I lost my Grandfather several years ago, and I still remember so much about him and how much I miss him. This year I truly reflected on eternal families. We enjoyed seeing all our relatives. I saw cousins I have not seen in 8 years. and I enjoyed seeing my grandparents. Each time I see them is precious, life is so short. Here is my grandma Betty and grandpa Kent. I love them so much too. It is always a blessing to get together with my grandparents, from both sides, I have been lucky to have grown up with them. We also took the kiddos down to temple square one night. we had been out to eat and weren't sure if the kids would last because we took them to a mini carnival all day, but we drug them through and they were amazed at what they saw. Conner's first request was to see the conference center. We have never seen the inside since it was completed, and he was amazed. We were ten minutes too late for the last tour of the evening, maybe next time. We headed to the tabernacle next, and it was all set up for the Christmas session on Sunday. We sat there for a long time and then when we told Conner it was time to move on he said." Well, we have to wait for them to sing." Poor thing thought the choir was going to come out and sing. We took them over through the lights, and it was freezing cold, but somehow the atmosphere seems to distract you. We caught this picture of Conner and Taylor in front of the temple. Taylor asked me if that was the castle I got married in. I told her yes, and she said one day she would get married in that castle too. Innocent and sweet are the little ones. I have more photos of our trip and will post them as soon as I retrieve them all. We had a good trip all in all. Cousins played, adults laughed, and families gathered. Christmas. I'm so glad you had a good trip to Utah and made it there safe. I know how you feel about the drive! It took me 7 1/2 hrs to make the trip from Boise. So I completely feel for you! You look great by the way! I love that white top. Christmas looks likes it was fun with the family. The kids are so big! I love the previous pics of the kids in your bed. Glad you made it safe and were able to see everyone. Jenica! I can't believe you guys had to drive 45 mph the whole way...yikes!! I'm so glad you guys were safe though and that you had a good time once you got there. I love the picture of Conner and Taylor in front of the temple. It looks so pretty. I've never been to temple square at Christmas, but I've always wanted to. It's quite the sight.